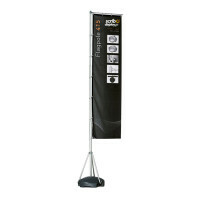 Scribo Displays offer giant flags with the poles mounted on aluminum tripod bases and screwed on to 50 litre water tanks. 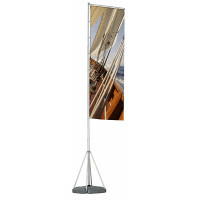 These giant flags are portable, easy to set up and are suitable for outdoor flag displays. They help you to forge strong bonds with your target customers. These giant flags which are great branding tools suited for open air events can be great attention grabbers when used for outdoor advertising/marketing. The giant flags ensure that your business remains the center of attraction and helps you gain superiority over others. If your business is looking for slightly bigger iteration, select our giant flags to use for your next outdoor event!